Registration is now open for NWT Champs, to be held March 8-10, 2019 in Yellowknife. Deadline to register is February 25, 2019. Find all the information you need to register on our NWT Champs page. Please be sure to view our December schedule and note the days we have NO ICE. Note: there is a Christmas Camp for the Competitive Skaters, January 3-5, 2019. After a relaxing holiday season, skaters should be ready to skate again starting on Thursday, January 3 for SS2 and Comp, Saturday, January 5 and Sunday, January 6 for LTS/SS1, Monday, January 7 for Special O, and Tuesday, January 8 for SS3. The Club is hosting a FREE skate for all its registered skaters and families to celebrate the holiday season. Please join us on Saturday, December 22 from 4:00 – 5:00 at the Shorty Brown Arena at the Multiplex for a fun skate, cookies, hot chocolate and a visit from the ‘Big Guy’ himself. All skaters must wear a helmet please! The YKSSC Schools Ability Meet will take place Saturday, December 1, 2018. The Ability Meet Information Flyer and Online Registration Form can be found on the Ability Meet page of our website. Deadline to register is Friday, November 16. The registration fee of $20 (Rockets are FREE!) 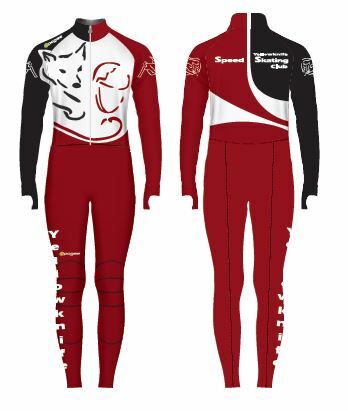 can be sent via EMT to ykspeedskating.regs@gmail.com. Please be sure to use the password “yellowknife” and indicate which skater your transfer is for. If you prefer, cash or cheque (make out to YKSSC) can be given to Jody or Myra. Lots of on-ice and off-ice volunteers and officials are needed to run an event like this. If you are able to help, please email Martin. If you are interested in being the Food Coordinator, please email the Ability Meet Coordinator (Jody). You can drop your skates off with one of the Sr. Competitive skaters during their Sunday ice time. The cost is $10. Do you have a child that knows how to skate and is interested in trying Speed Skating? Or maybe you want to try yourself! 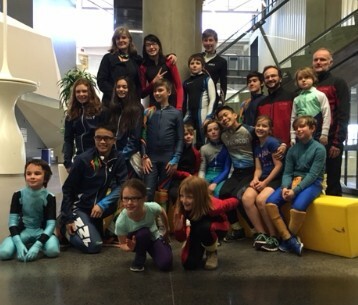 On October 14, the Yellowknife Speed Skate Club (YKSSC) is hosting an Open House Skate and Bring-a-Friend to Class. There is no cost to join YKSSC opportunity! • Come out and learn what speed skating is all about. • Play games and learn drills. • Try out a fun and positive on-ice sport. • CSA-approved helmet and gloves. • Hockey skates. Figure skates are not permitted as the tips make holes in the ice. There will be a limited supply of speed skates available for guests to try at no cost (only available for Multiplex classes). • A signed waiver, which you can do before you get on the ice. Anyone under the age of 18 needs to come with a parent or guardian to sign for them. We will have waivers on hand for you to sign. We have two upcoming bagging opportunities giving our skaters (10+) who travel to out-of-town meets a chance to earn some money back. Follow this link to sign up for the October 13 and December 22 dates. We need parents help too please! If you can’t access this link, please email Heather at hmnystrom@hotmail.com with your requested times. The camp is aimed at competitive youth skaters (L2T, T2T and Juniors) who wish to improve their technique. It will run Oct 12 – Oct 14. The Head Coach for the camp is Sue Ellis from Rothesay, New Brunswick. Sue is a Level 4 NCCP coach, and 2002 US Olympic Short Track Team Head Coach. This will be a technical camp, the focus is working on skill development. The camp participants will watch video of Elite World Cup and Olympic skaters, and analyze the technique and motions that the skaters perform as they skate. The camp participants will then attempt to recreate the motions in dry land exercises and then transfer those skills to the ice. One of the main differences of this camp, is that the skaters will develop an understanding of the technique that they are trying to develop and why; they can then use this knowledge when they analyze their own skating in the future. The camp will run from approximately 8:30am – 5:00pm each day, with two ice times, dry land, video analysis, and one hour for lunch. Cost for the three days is $270 and we have a limit of 25 skaters. More information can be directed to ianmellors@shaw.ca. They welcome skaters on a first come basis up to the 25 maximum. As noted in our Skate Rental Policy, renters take responsibility for the proper care, maintenance and safe handling of the skates and blades during the rental season. It is recommended skates are sharpened monthly or every 5 -10 practices depending on skater’s size, ability and care of the blades. Your skates can be sharpened by one of our older skaters. If you need contact information for a sharpener, please look on our Facebook page or contact us for more information. We are back with a great season planned for our skaters! The easiest way to register is with the online registration form. All skaters must be registered before getting on the ice. Registration closes October 31 for the season. If you want to register in person or ask us questions about our programs, please visit our table at the Yellowknife Community Showcase, Wednesday, September 12 (from 6:00 – 8:00) at the Yellowknife Community Arena. You can drop a cheque off to us at the Yellowknife Community Showcase, Wednesday, September 12 (from 6:00 – 8:00) at the Yellowknife Community Arena. 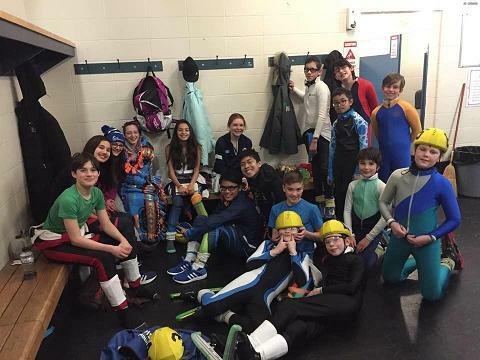 A variety of safety equipment is required for each skater depending of their program level. A full equipment list for each program is listed on the individual program pages on our website. For more information about appropriate safety equipment, visit Speed Skate Canada. Will you need a Club suit this season? 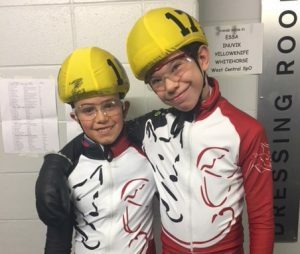 NWTSSA is holding their 2018 Speed Skate Camp on August 22 – 26 in Yellowknife. There is something for everyone this year including a new session for those who have never speedskated before but want to try it out. This is also the least expensive camp by far in Yellowknife! Register here! Volunteer opportunities are a way for our skaters to raise funds for end-of-the-year reimbursement for out-of-town meets they attended that year. The following opportunities will go toward the 2018/19 race fund. Co-op grocery bagging is Saturday, May 5. Heather will be looking for volunteers for the following shifts: 10-12, 12-2, 2-4. Email Heather to sign up please. Spring Clean-up planned for the third week of May (date TBC). We will email more information when we have it! Cleaning the shed this spring and need to get rid of those bottles? Consider donating your bottle refund to the YKSSC! Here’s how it works: bring in a maximum of 10 bags to the depot. Look on the side board for the YKSSC code (#4469334). Use their machine to print out labels with this code on it – one for each bag you have. Stick a label on each of the bags. Leave the rest to the Depot. Less work for you and we appreciate your donation! Our annual year-end BBQ and Annual General Meeting is scheduled for Sunday, April 29, from 6:00 – 8:00 PM at the Ski Club. We will provide the hotdogs, hamburgers and drinks. Please bring a side dish or dessert to share, as well as your own plates, cups and cutlery. At the AGM we will have elections for our 2018/19 Board. Karin has resigned as President/Chair of YKSSC (insert sad face here) so we are seeking a new leader. If anyone is interested in joining this amazing Board of volunteers (for any role), please let us know! On March 9-11, 2018, the NWTASSA will host its annual territorial-wide meet in Yellowknife. This ability meet involves all ages and abilities of skaters. Please visit our NWT Champs Page for a 2018 NWT Champs Reg Form and more information. Rockets are free and all other divisions are $45 per skater. Payments can be made via cash, cheque (made to Yellowknife Speed Skating Club) or EMT to ykspeedskating.regs@gmail.com. Please use the password “yellowknife” and indicate the skater’s name. Many officials and helpers are needed to put on this fun event. Please contact Martin Rourke at martinrourke@theedge.ca if you can volunteer as an official or meet helper. Positions include: timers, place judges, lap counters, runners, clerks of course, on-ice track stewards. We need volunteers to help feed our meet volunteers! If you are able to make something, please contact Jody directly at jlsnortland@gmail.com or call her at 445-4774 and tell her what you can bring. Again, this will be a screen-free event so please leave the electronics at home and get ready to cheer!! New to racing meets? Check out the Parent’s Guide to Races. We have create a CLOSED (meaning you have to be a member to post on the page) Facebook Group page for easier internal communications amongst our membership. We have sent out email invitations to all of our members to join the page. 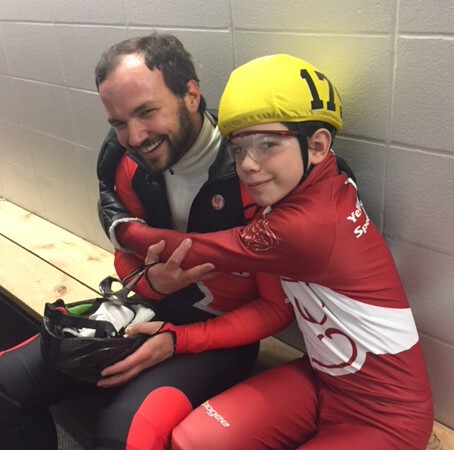 If you did not receive one, follow this link and ask to join the YK Speed Skate Club page. The page is intended to be a place for us to post YKSSC information and reminders, and for members to ask questions, post lost and found items or equipment for sale, suggestions for the Club, etc. If Facebook isn’t your thing, you can still email us! It is not mandatory you join this Facebook page to stay up-to-date. All posts the YKSS Club puts on the page will still be sent out via email or the newsletter to your email address. And posted here on our website! 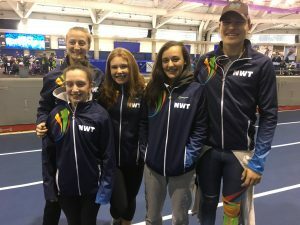 AWG Trials for the Speed Skating NWT Team are happening Friday, January 19 (6:30 – 8:00 PM) and Saturday, January 20 (9:00 – 10:30 AM). Come out to Ed Jeske arena to watch some great races and cheer on our skaters! Mark your calendars for the NWT Champs Meet, scheduled for March 10 and 11 in Yellowknife. This meet is hosted by the NWTASSA and brings together all territorial clubs for an exciting two days of racing! Stay tuned for more details on volunteering and registration (not open yet, but will close February 25). RU Fast is a fun Meet taking place in Calgary on March 3 and 4, 2018. This Meet is suitable for all abilities and ages. YKSSC out of town meet policy indicates skaters under the age of 10 must be accompanied by a parent. Skaters 10 and up and can travel with the team coach and chaperone. If you might be interested in attending this meet, please email us by January 16. These plans are not written in stone, we are just trying to get a feel of who might want to attend this out of town meet. The top 64 junior short track speed skaters in Canada will be in action this weekend, December 15-17, at Saguenay’s Centre Georges-Vézina for Speed Skating Canada’s 2017 Canadian Junior Championships. 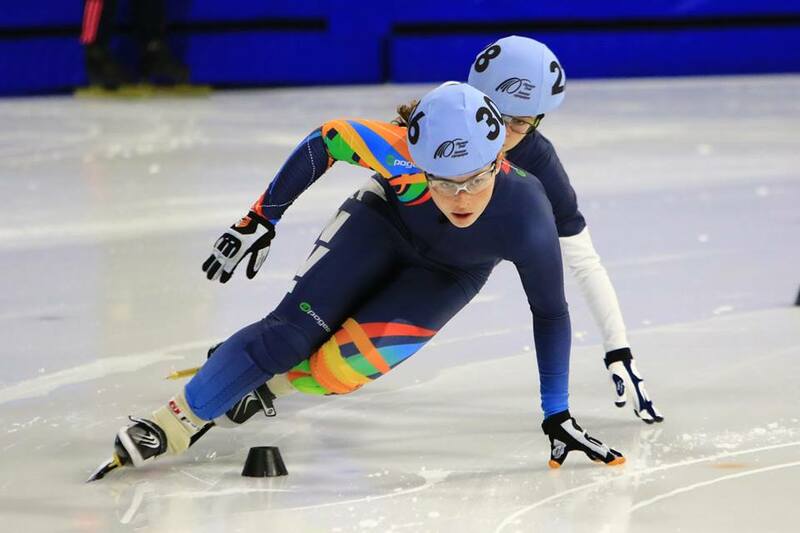 The 32 male and 32 female skaters, between 14 and 19 years of age inclusively, will aim for one of the four spots per gender available to represent the country at the 2018 World Junior Short Track Championships to be held March 2-4 in Tomaszow Mazoviecki, Poland. 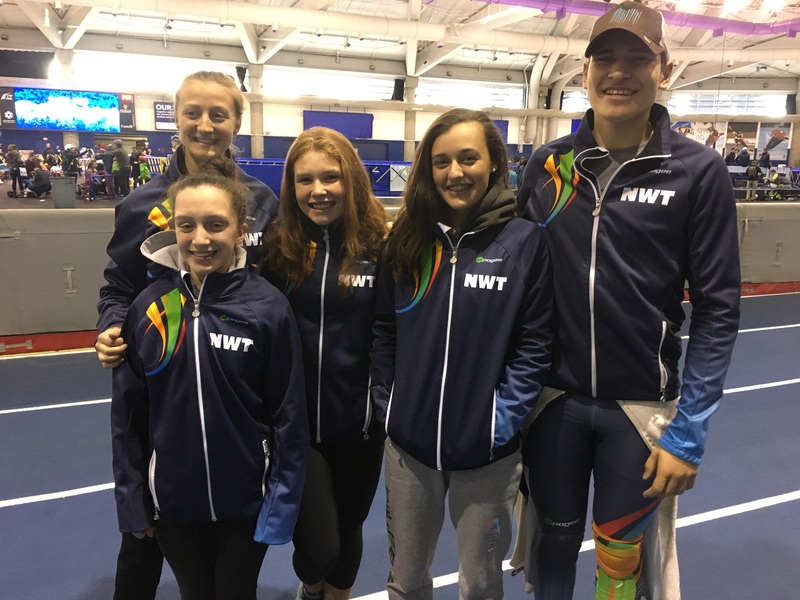 They will be chosen based on their overall results at the Canadian Junior Championships in the 500m, 1000m, 1500m and 1500m Super Final. The Club is hosting a FREE skate for all its members & families to celebrate the holiday season. Please join us on Saturday, December 23 from 4:00 – 5:00 at the YK Arena for a fun skate, cookies, hot chocolate and a visit from the ‘Big Guy’ himself! Please be sure to view our December schedule and note the days we have NO ICE. Note: there is a Christmas Camp for the Competitive Skaters, December 27-29. After a relaxing holiday season, skaters should be ready to skate again starting on Thursday, January 4 for SS2 and Comp, Saturday, January 6 and Sunday, January 7 for LTS/SS1, and Sunday, January 7 for SS3. The Arctic Winter Games is looking for volunteers to work the Speed Skating competition in Fort Smith, March 18-24, 2018. Race days will be Monday, Tuesday, Thursday and Friday. There is some housing available for out of town volunteers, but no travel or meal assistance can be offered at this time. They are looking for experienced volunteers that are willing to share accommodation. Preference will be given to volunteers that have training and experience with the roles of Ice Steward, Place Judge and Timing. Also preference for those that will work all four days of racing and assist with set up/take down. Contact Jane Peterson at speedskating@awg2018.org if you would like to volunteer or have any questions. Include in your email any roles you are interested in, what training you have and if you will require accommodation. The skater/coach clinic with Debby Fisher has been rescheduled to January (date TBD). There is no fee for the clinic and the skaters will just need to attend their regular program times. More information to come in the New Year. Welcome to a new season! Currently we have 114 skaters registered for this year and all programs are off to a great start. Registration is open until November 15 if you know of anyone that still wants to join. Many thanks to our Registrar, Myra Bowerman and Treasurer, Jody Pellissey for ensuring complete registrations.